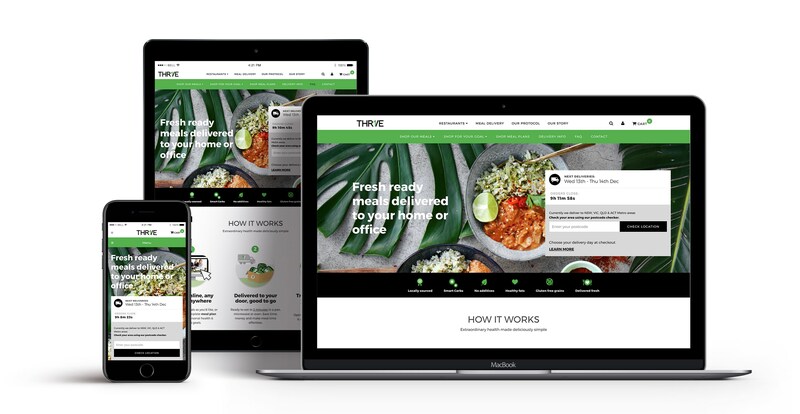 THR1VE, an Australian restaurant chain specialising in fast nutritious meals undertook customer research showing a market push for healthy home delivered meals and meal plans. Though accelerating quickly in the healthy takeaway industry with their restaurants, home delivery was new territory for the brand.The experience needed to compete within an established market of providers on convenience, aesthetic and functionality. A with a foray into any new venture, extensive customer and platform discovery needed to be undertaken prior to solution design. This ensured not only shared goal alignment, but also the discovery and design phases to work seamlessly across purpose, need and aesthetics. To design an effective solution we started from scratch with only an existing WordPress site and an app as customer facing tech platforms. 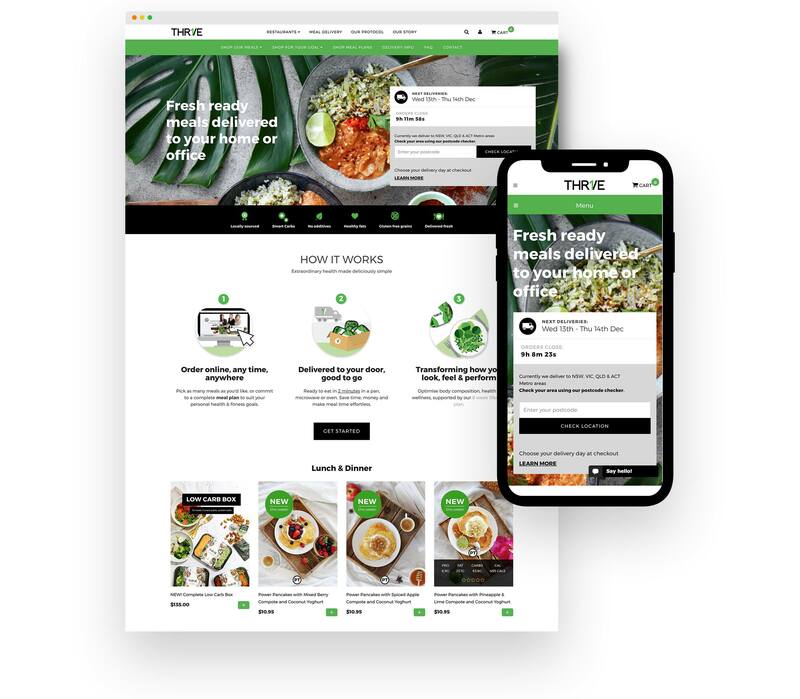 We needed to integrate an effective eCommerce platform that would allow for both individual meal products as well as meal plan subscriptions and alterations. The solution needed to incorporate customer facing services such as a postcode checker for delivery availability and order cut off times. We would also need to design a solution that worked with the backend users. It needed to send orders to the kitchen making the food, and order and delivery details to the distribution provider in a timely manner for a smooth fulfilment and distribution chain. The entire solution needed to work as part of what was to become the brand’s foray into a multichannel food supplier that kept to the brand’s promise of fresh healthy meals, and aesthetically strong presentation. Customers also needed to be provided the same ability to choose and customise their meals for delivery as they would in store, being able to easily identify meals that suit their lifestyle and dietary requirements. To solve the technology challenges in delivering this initiative, we chose to build their eCommerce service on Shopify for a simple, hosted and easily customisable solution. Using customised plug-ins to solve for some service requirements such as the postcode checker and delivery cut off and availability challenges, we were able to set up an eCommerce platform that was easy to manage and update for their in house team. Exports were used to inform the kitchen and distribution companies of the orders placed each week. The meals site has been integrated with the existing THR1VE WordPress site to blend the two offerings of restaurant and take home meals. An iterative improvement plan over time has delivered ongoing initiatives to market, in turn providing better experiences for their customers.